As the days go by, xat continues to update it's style. We've recently had lots of interesting feedbacks from the shortname page and some were taken into consideration. If you haven't seen that post yet, then please check it out and give your feedback towards it. We look forward to hearing from you there! The power page was a major key update towards HTML5 and it's been in the works for a while. Today I present to a preview of the new powers page and whats to come from it. Here's a gif of the power page being roamed through: roaming the powers page. (gif program makes it a bit choppy - apologizes for that). Users will have a wide variety of selection to powers, such as standard powers, rare, epic, group, games and then all. Two other pages were also updated. 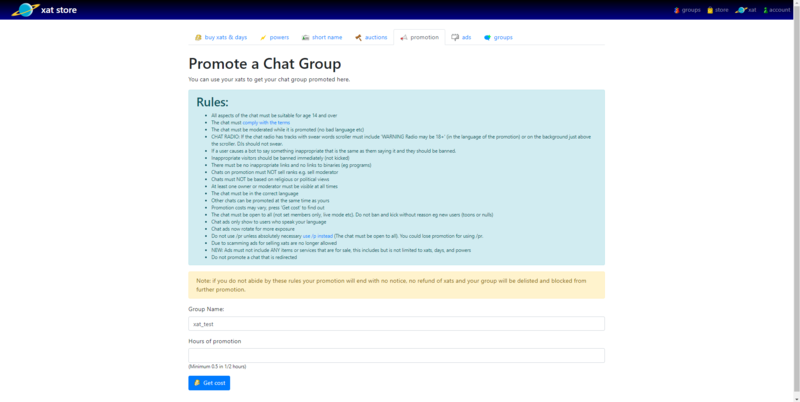 Promotion page to advertise your chat on xat's homepage. 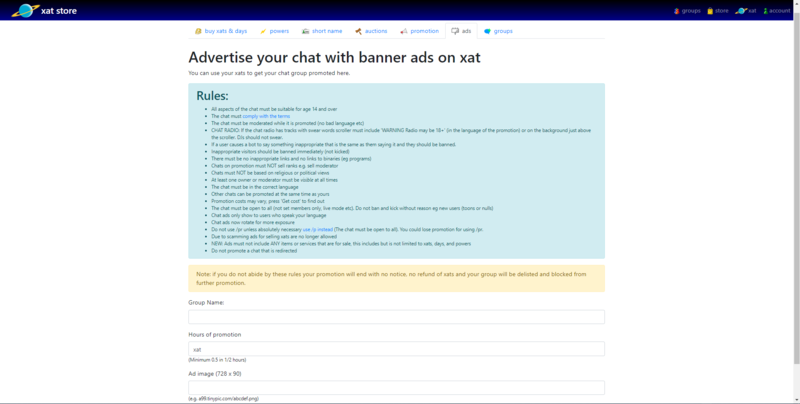 Ads (advertise) page to advertise your chat with a banner around xat. Previews can be found here for each updated page. There's more updates to come and we'd like to gather everyone's input from now until then. It would be great to hear what everyone thinks of these updates as well. I look forward from hearing from you guys. Thanks and stay tuned for more changes and updates to come. Note: Keep in mind, these pages can be changed any time whenever the Administrators feel like. New changes and title of post was changed. It looks great, thank you! advertising is not allowed right ? or you talk about xat.com/promotion ? It looks pretty good, in all honesty. Is it possible the teal/blue box on the powers page be fitted to the text length like the other pages? It would look better that way, in my opinion. It would also be nice if the buttons could be aligned to the left instead of centered mainly because your eyes are already reading from the left, and they would be more inclined to follow that than to go all the way to the center to click them. I also assume the Mark All Powers button will return? I really don't like the way it currently is (with the check marks) and hope that maybe there's a way for it to just list the ones you're missing. This should also be an option for say... everypower, collections etc. I would like new descriptions for each power! The following pages for HTML5 should now be live. If you see any bugs, or issues or even have some suggestions on how to improve these pages, then please don’t hestitate to share them here. Just a small thing. Why don't you try to make these pages more user friendly? E.g: "Sorry, group not available" for "You can't buy this group because it is not inactive for 3 months"
Today 1335 units of the new power MEERKAT [ID: 539] have been released at the store until now. However, it looks like there is a problem with the new version of the store, since many users who used this version and tried to buy more than one unit, they only could get one. Is it possible that there is something wrong with it? We will check this out. Thanks for notifying. The only error that gives me is the ''Cost changed.''' but after that, nothing.